Twitter is trading above my monthly value at $32.24 after nearly testing its quarterly risky level at $35.33 Wednesday. This is the buy zone for the stock pre-earnings. As Twitter, Inc. (TWTR - Get Report) reports earnings before the opening bell on Thursday it is poised for an upside breakout. The stock is above my monthly value at $32.24 after nearly testing its quarterly risky level at $35.33 Wednesday. This is the buy zone where the stock should be bought pre-earnings. A breakout above my $35.33 sets the stage for a rally to my annual risky level at $48.99. The stock closed Tuesday at $34.37, up 19.6% so far in 2019. Due to the volatility over the last 52 weeks, it is in bull market territory up 30.9% since trading as low as $26.26 on Dec. 24, but also in bear market territory 28.1% below its 2018 high of $47.79 set on June 15. The stock was down Wednesday 0.61% at $34.16. Today, political tweets should be in abundance in reaction to President Trump's State of the Union address Tuesday evening, but the Twittersphere is quiet. The president is letting his presentation speak for itself. Twitter is a platform suitable for healthy debate, but it has been tough to control inappropriate tweets, and the social media giant suffered a loss of monthly active users in the second quarter. The stock got crushed when it reported back on July 27. You will see this huge price gap lower on the daily chart. This condition improved in its third-quarter earnings that were reported on Oct. 25. Analysts expect Twitter to show earnings of 25 cents to 29 cents when it reports before the open on Thursday. Keep an eye on monthly active users, guidance on advertising dollars and their policy in policing for inappropriate tweets. The daily chart for Twitter shows the price gap lower on July 27 which was a crash of 12.7% from the July 26 close of $42.94 to the open of $37.47 on July 27. Since then, the stock has been moving in a trading range that showed stability following a positive reaction to earnings on Oct. 25. The close of $28.74 on Dec. 31 was the input to my proprietary analytics and resulted in the horizontal line at $35.33, which is my first-quarter risky level. The Jan. 31 close of $31.56 resulted in my monthly value level of $32.24. These levels outline my pre-earnings neutral zone. The 200-day simple moving average at $34.09 is an important level to be above at today's close. 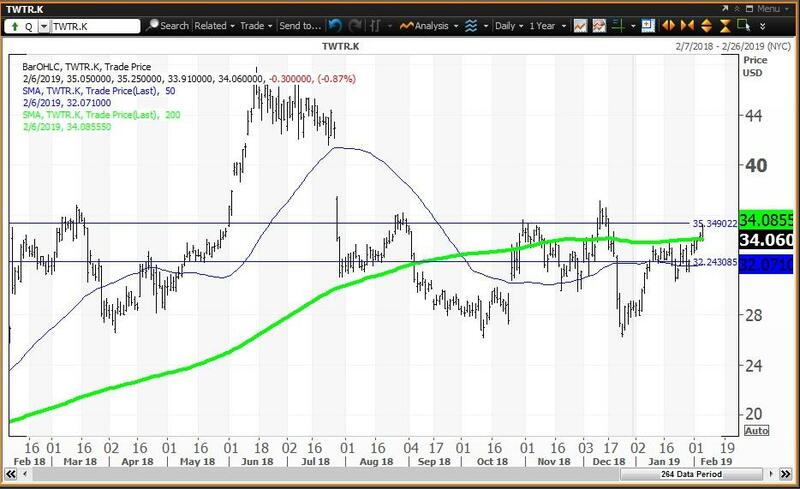 The weekly chart for Twitter has been positive since the week of Jan. 11, 2019. The stock is above its five-week modified moving average of $32.56, which is the staging ground for rising momentum. The 200-week simple moving average or "reversion to the mean" first formed during the week of Sept. 1, 2017. This key average held at $26.96 during the week of April 6, 2018. The 12x3x3 weekly slow stochastic reading is projected to rise to 58.58 up from 55.07 on Feb. 1. This is a reason to be long. 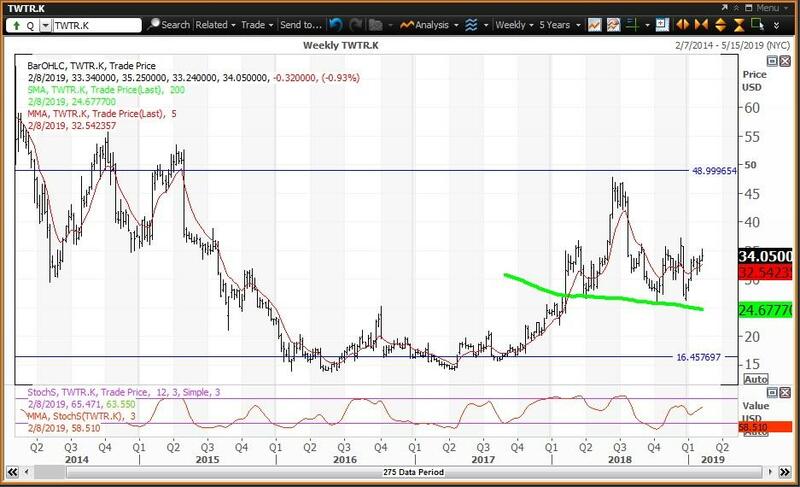 Trading Strategy: Buy Twitter down to my monthly value level at $32.24. A breakout above my quarterly pivot at $35.33 targets my annual risky level at $48.99, which is on the weekly chart.